The Moccasin Gap Trail system consists of about 43 miles of trails about 20 miles N of Russellville along and west of AR-7. Open to hikers. equestrians, ATVs and mountain bikes. Seems to be all logging roads. Some nice scenery. Day use parking lot is at 35.5712, -93.0685. 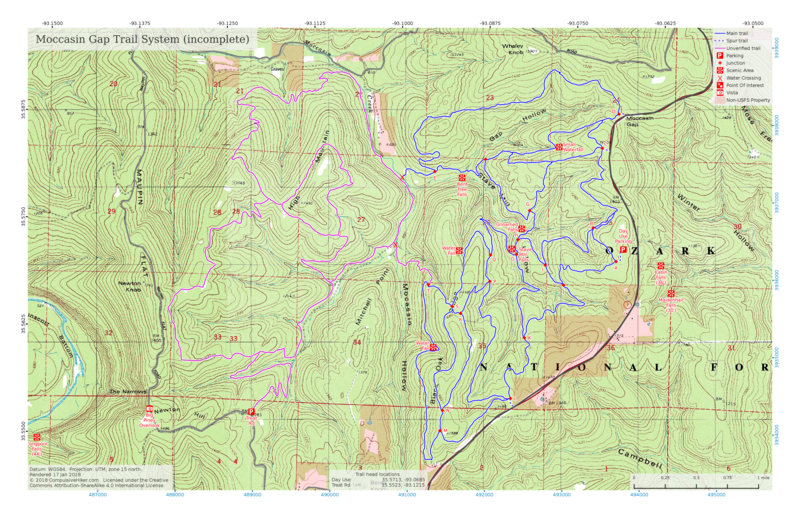 USFS trail map. Dec ’15 report. Click on the image to get it full-size. Every time I update the map the image will have a different name so if you want to bookmark or share the map, link to this page – not the image. Will print at 1:24000 scale on 11×17 paper. Jan 17 ’18 update: Highlighted surrounding major roads. Updated the map styling. Aug 18 ’16 update: I’ve added a preliminary track for the west half. That data wasn’t collected by me and I can’t vouch for it but will verify it ASAP.